Floorball is a popular European indoor sport. A team game, a plastic vented blade attached to composite or carbon sticks are used send a light plastic ball into the opposition's goal. Most commonly played in the Czech Republic, Finland, Norway, Sweden and Switzerland, the popularity of floorball is increasing in non-European countries. You can now find floorball being played in Australia, Canada, Japan, Singapore and the United States. A team of six players takes to a court in floorball. The aim is to score as many goals as possible using their sticks by sending the plastic ball down to the other end of the court and into the oppositions goal net. During a game of floorball the ball must be controlled and directed by the players using the bladed stick. The arms, hands and heads of the players cannot be used, though other body parts can be used. It is legal to use your feet, though you cannot kick the ball to a teammate, or to score a goal. Most commonly, players use their feet to stop the ball. In floorball the team is divided into 5 field players and one goalkeeper. The five field players must try to score goals for their team while the goalkeeper must try and deny the other team from scoring by defending the net. For this purpose, the goalie is allowed to use special equipment. Both trousers and shirts worn by the goalie are padded. Gloves are permitted, but mitts are not. A helmet is worn to protect the goalies face. Goalkeepers are unique in that they do not use a stick during floorball. They must rely on their body to stop the other team from scoring. The protective garments worn by the goalkeepers are for their protection, but they are not allowed to use garments that make them substantially larger, thus helping them to fill the goal area better. 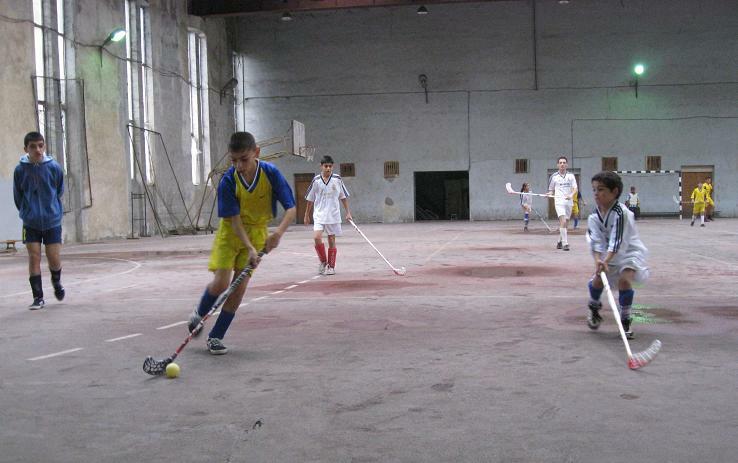 Floorball is played on a court, or field, of 40 x 20 metres. This area is contained by a 50cm tall board with rounded corners. The goals measure 1.60 x 1.15 m and are 65 cm deep. The plastic or carbon sticks used by the field players measure just over 1 metre. A length of 99 cm is allowed for the shaft, with the extra length coming from the plastic blade. A 72mm diameter ball, weighing a maximum of 23 grams, is used in the game. Each ball is designed with 26 holes. Every two years a world championship tournament is played between various nations. Sweden are currently the reigning world champions with both the women (2007) and the men (2006) taking out the title.